Starting in 1991, I ventured into the publishing world with my first newsletter Take It With You. I also had several gigs as a freelance writer for several publications. And moving forward in covering portable devices, I published a magazine called Portability! – Personal Electronics Magazine, along with a good friend. It wasn’t a success, but is something that I am still proud to have done. In 1997, due to various (and regrettable) circumstances, I left the publishing world and focused on my IT career as a Network Administrator. Over the last 14 years, I have missed writing and am working on returning. At this time, I am working on two short stories, two novels, three movie scripts and a paid writing position for a publication. I am also returning to the freelance market, as well as being an unpaid writer on various blogs and websites. The first of these happened on March 22, 2008 when I was accepted as an Associate Writer on Palm Addict, a mobile device blog that has 122,000 daily readers. As I expand my work to other sites, I will post them here on this page. I have missed writing, which I have always considered my greatest love in life. And as I make major strides back into the publishing and journalism world, I will make efforts to keep this page of my work updated often. Below are two sections: Current and Previous. Current will have links to and/or copies of the articles I write (based on permission to repost any work I have done). Also I will provide links and excerpts to my novels, screenplays and short stories. As for the Previous section, all printed articles will be scanned and made into PDF documents for downloading, reading online and for my own personal archiving (an added bonus). Check this page often as I plan to have updates on a regular basis. 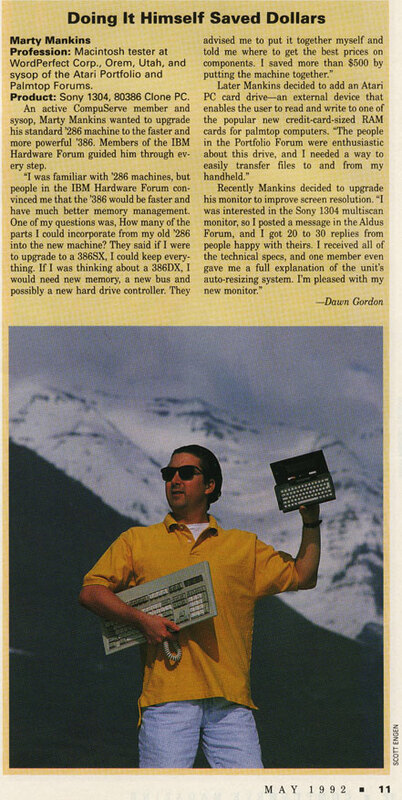 – This blurb was penned by Dawn Gordon, a Sysop on CompuServe, but featured myself in a computer upgrade story. The photo of me was taken near the Geneva Steel Plant in Orem, UT.